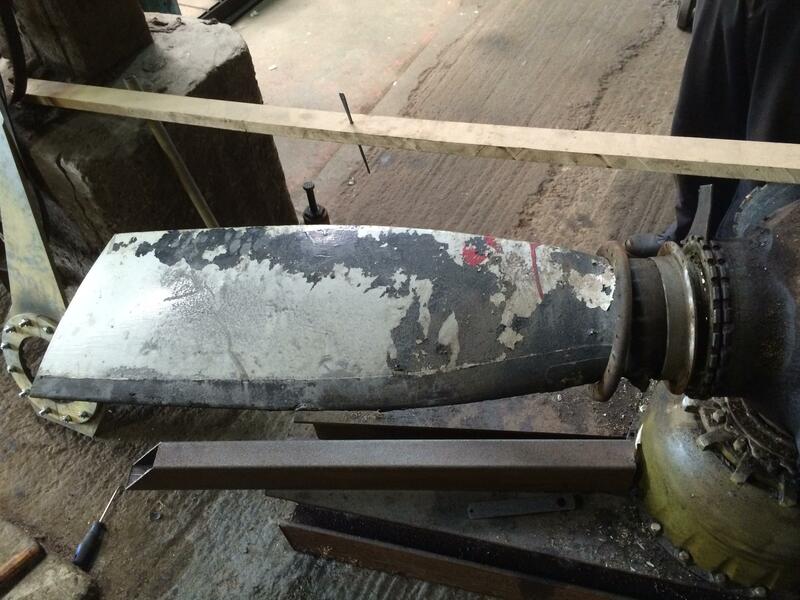 After working hard on the prop we decided to chill out a bit and spend a day finishing off the 216 exhaust. 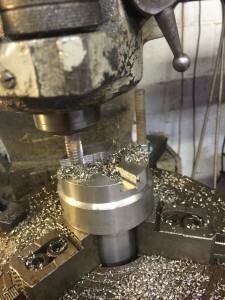 Fitting all of the split pins to the cylinder clamps. 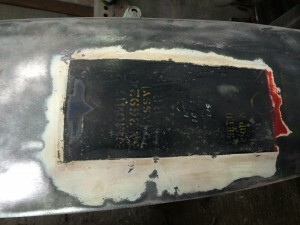 All the blanking plugs fitted to stop moisture and dust getting in. 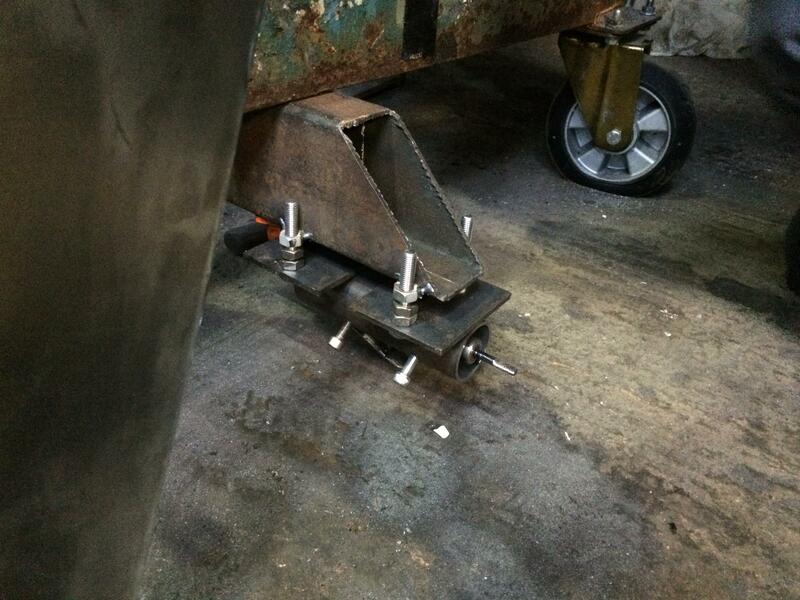 There we go all done, heat shields refitted with new Jubelee clips, It’s getting there, it won’t be long now! 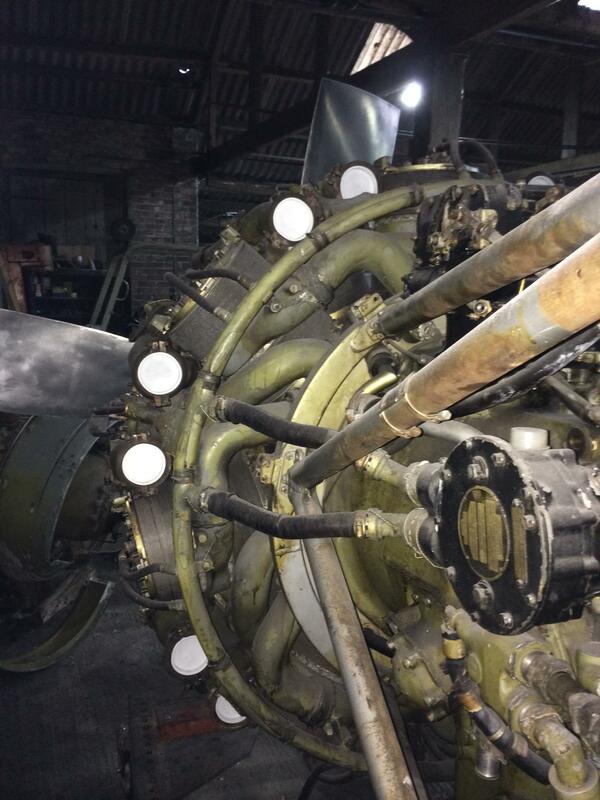 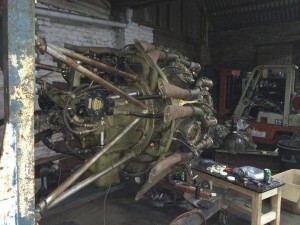 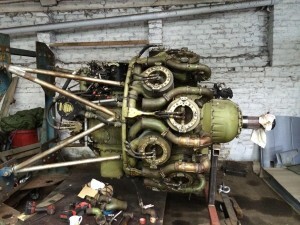 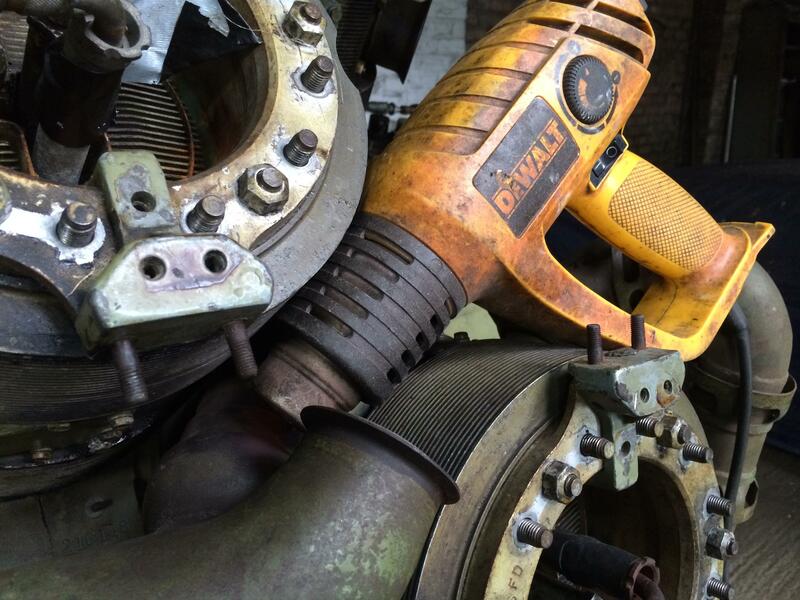 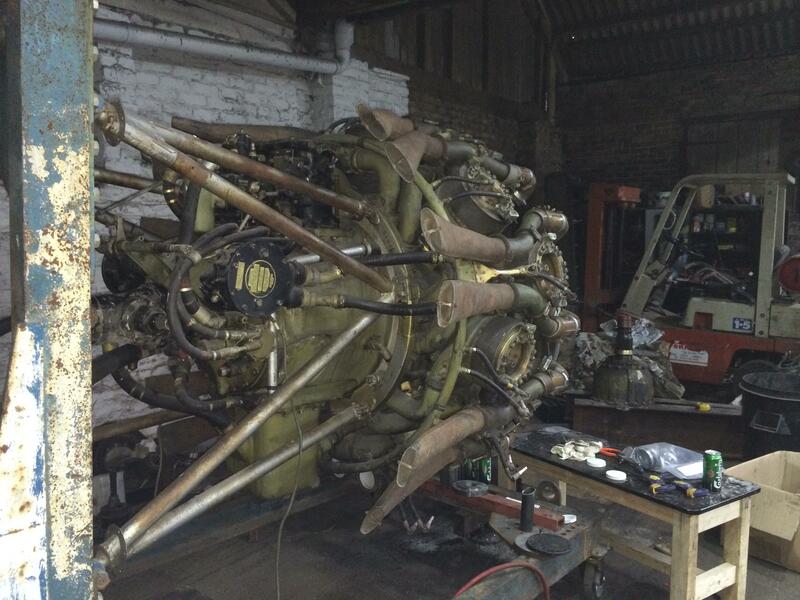 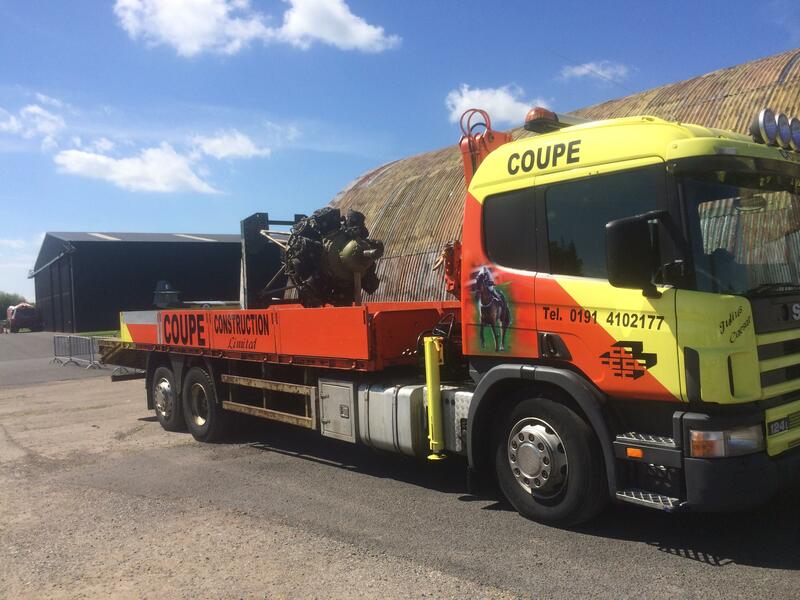 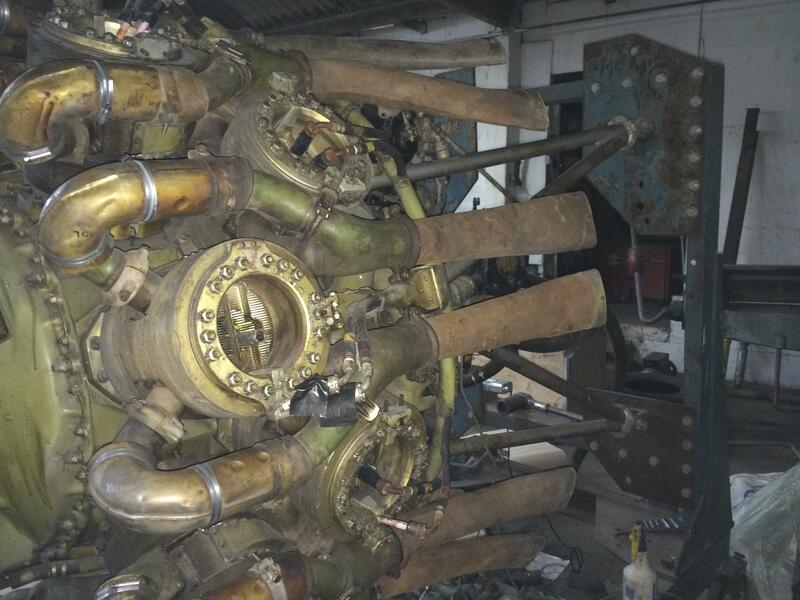 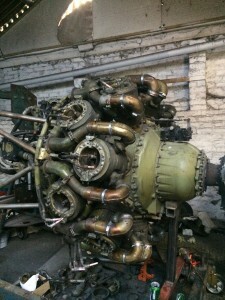 Thanks to Karl over in Canada at 57 Rescue for the exhaust pipes, now that should sound nice…..
After getting the 264’s back into our workshops we ripped straight into them and started to strip down the propellers. The first job was to strip down the pitch control mechanism. 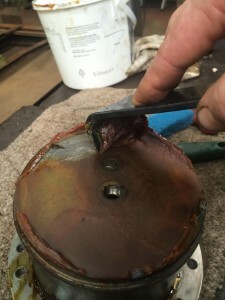 Then remove the blades. 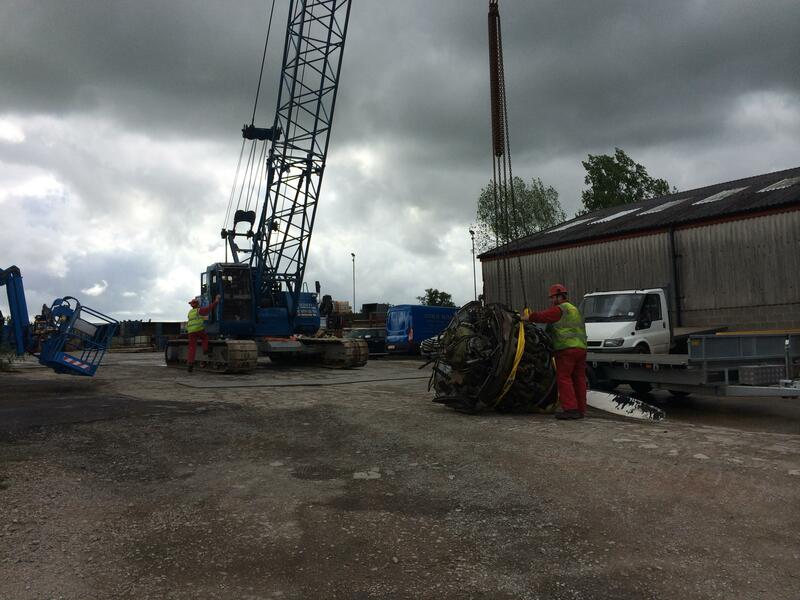 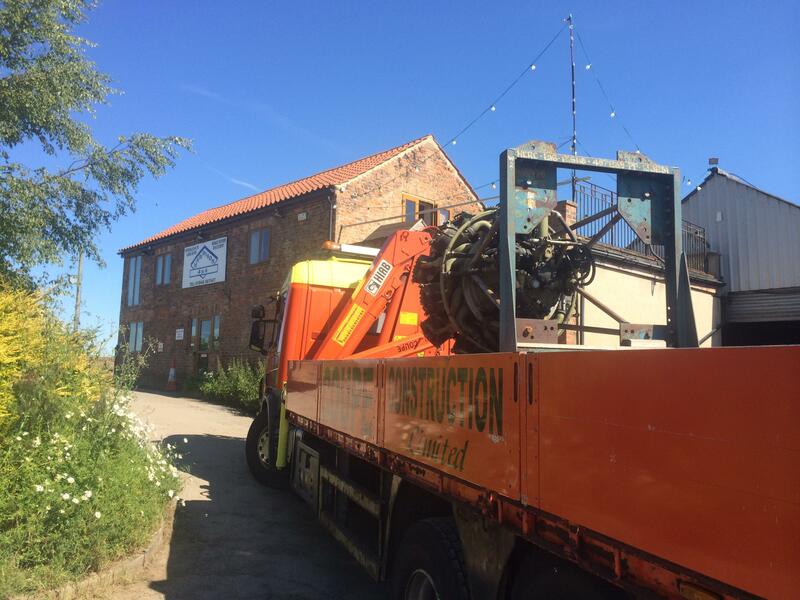 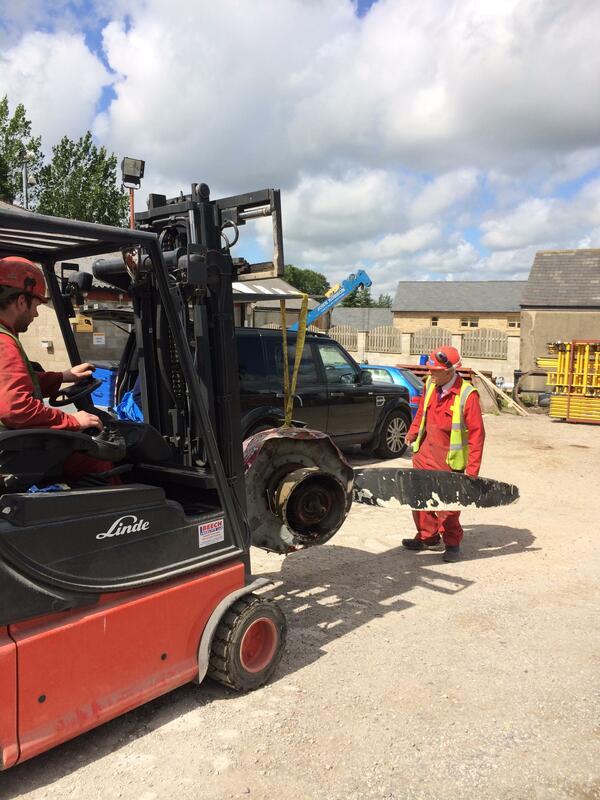 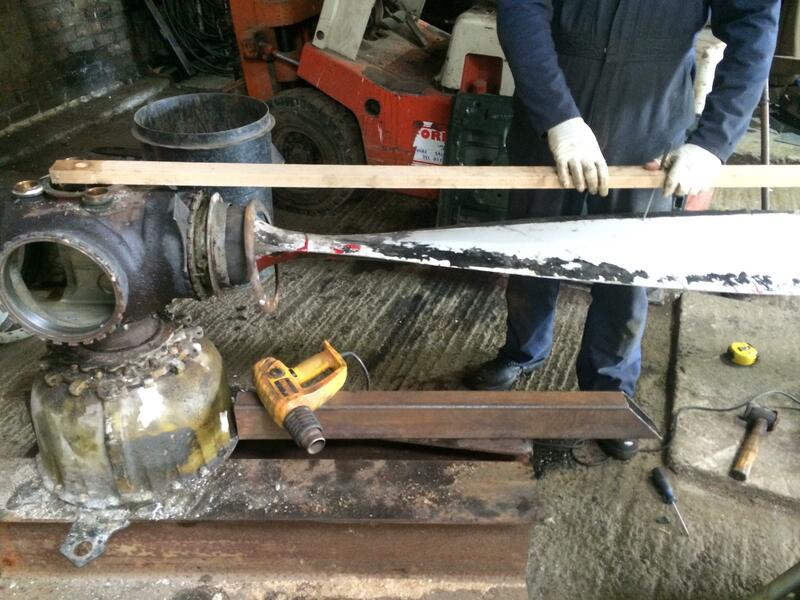 We use the removed reduction gear bolted to a couple of beams to allow us to a 20 tonne jack to loosen of the blades. 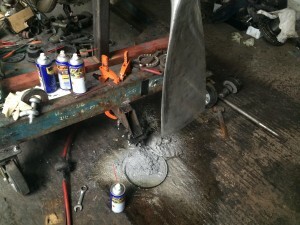 Once the hub was stripped down Pete soon had it cleaned up, etched primed , then a coat of primer filler ready for top coat. 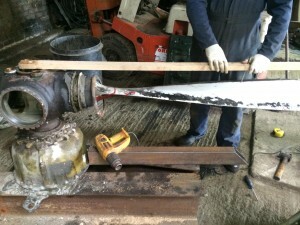 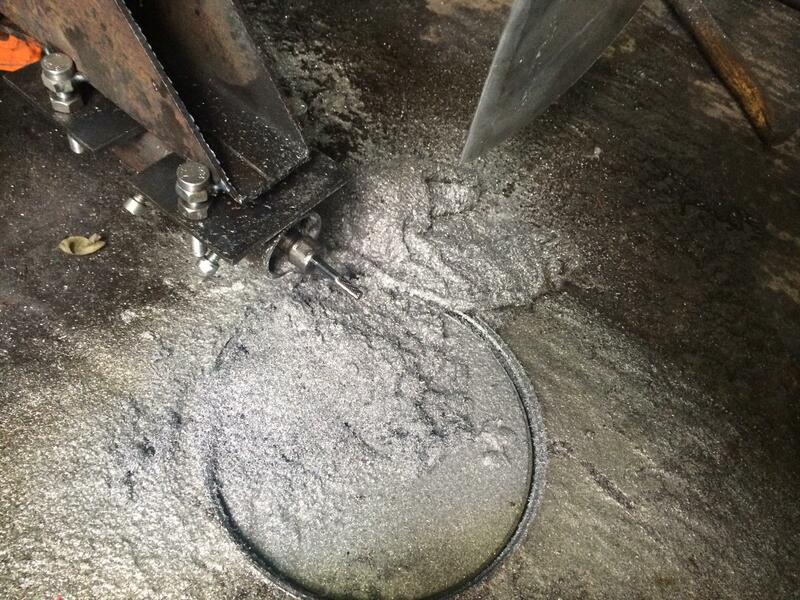 Next job was to cut the blades down, we used the oil feed tube and a piece of wood and a scribe to mark the blades, then a 9″ grinder with a slitting disc to cut them down. 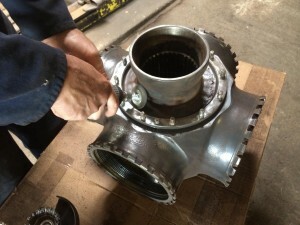 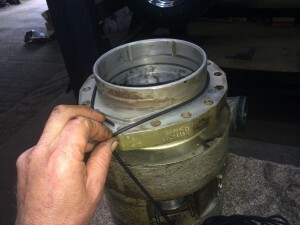 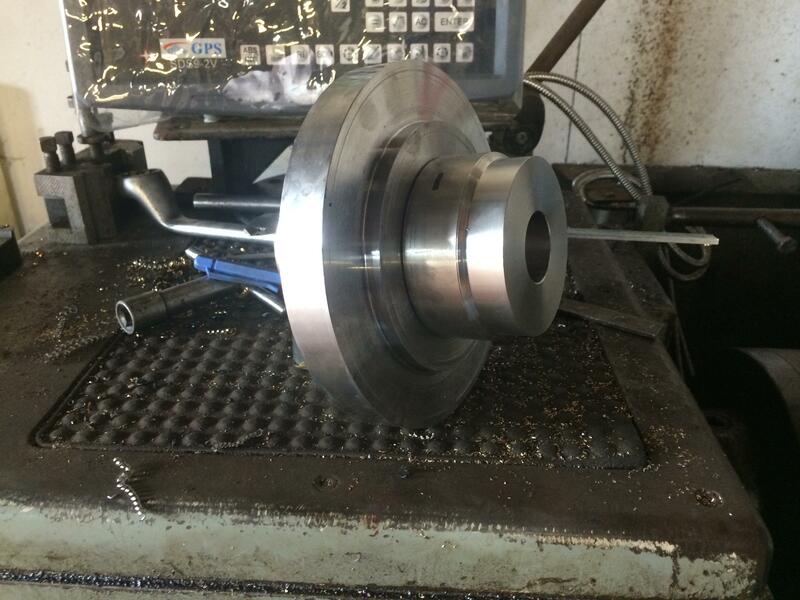 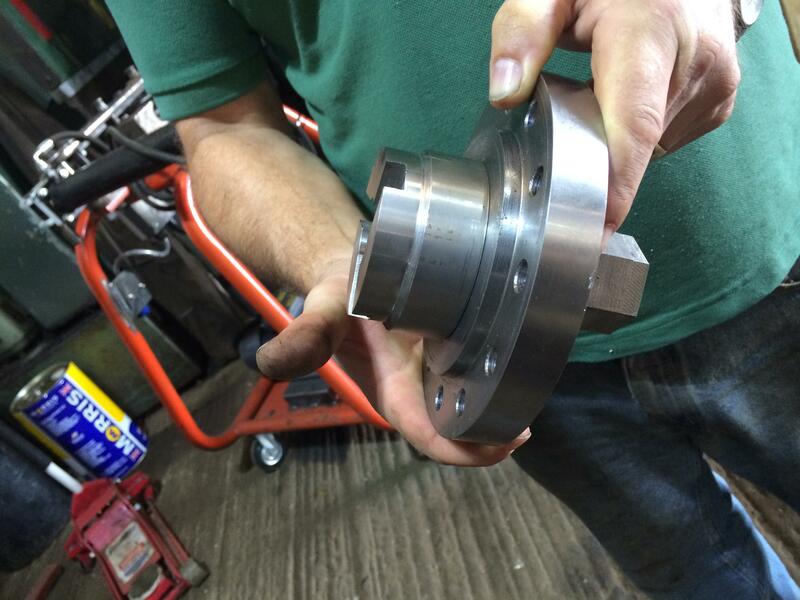 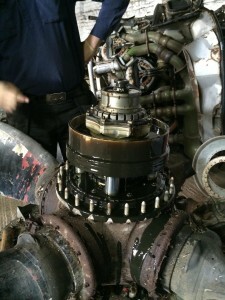 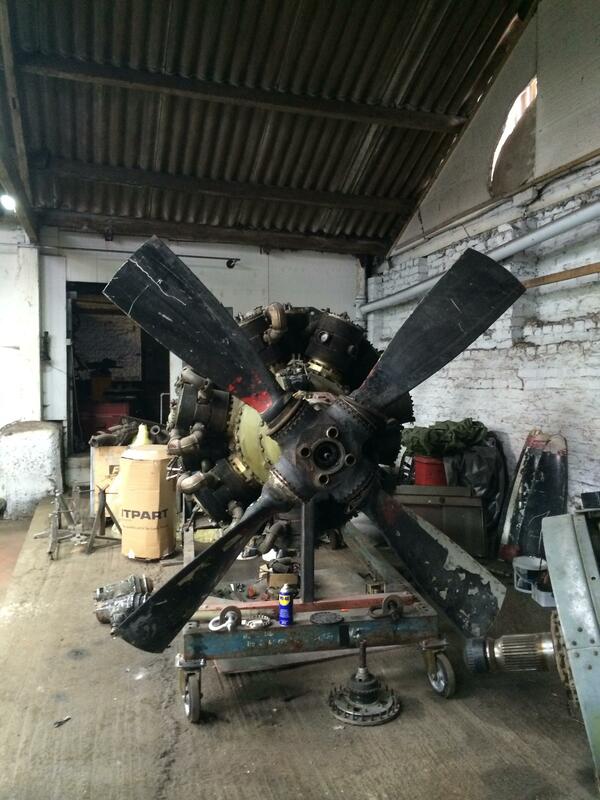 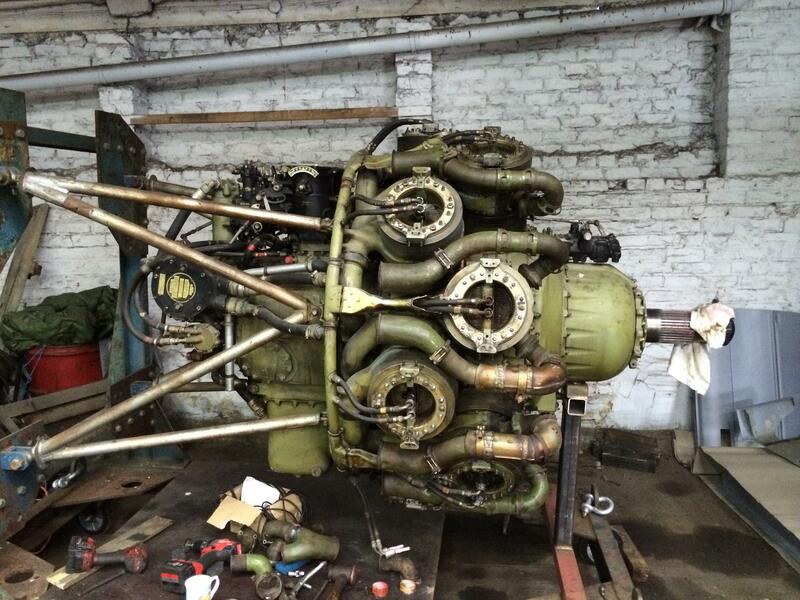 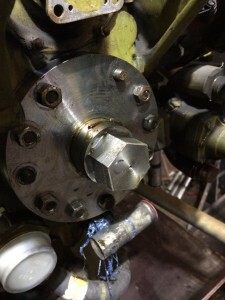 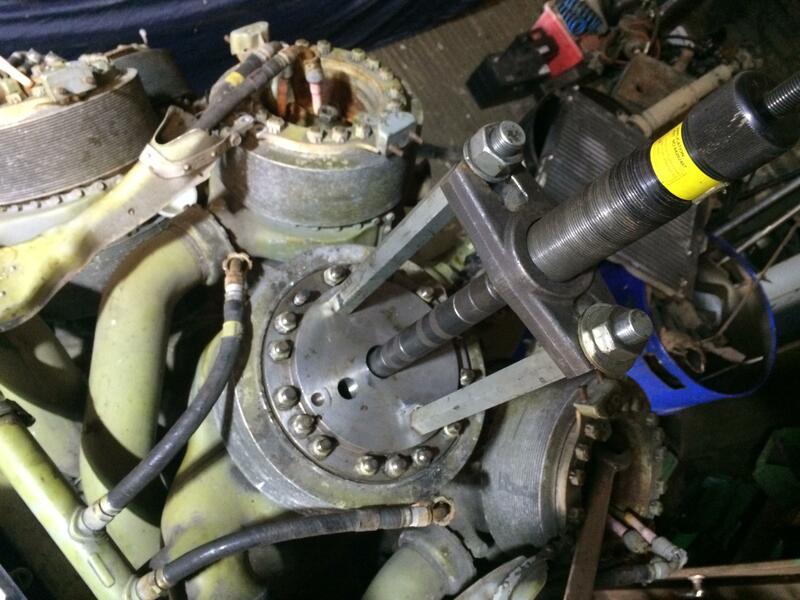 We then fitted the other hub to the engine and test fitted the blades. 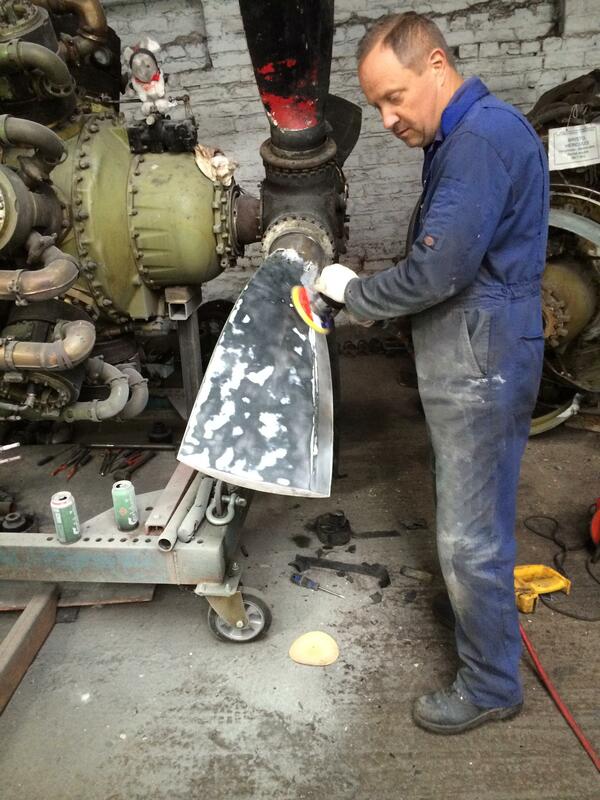 As Pete had a couple of days off , he decided to take on the sanding down of the blades, it took a full two days to do! 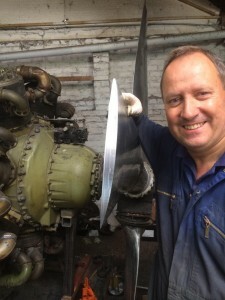 The next thing to do was make the blades all the same length. 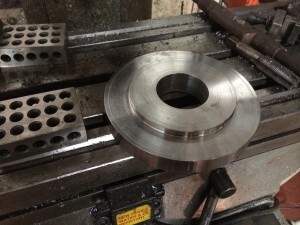 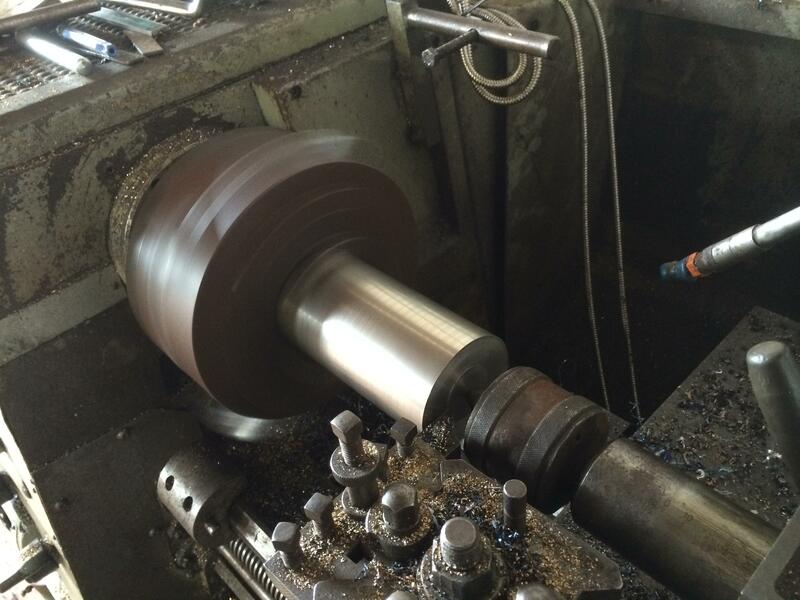 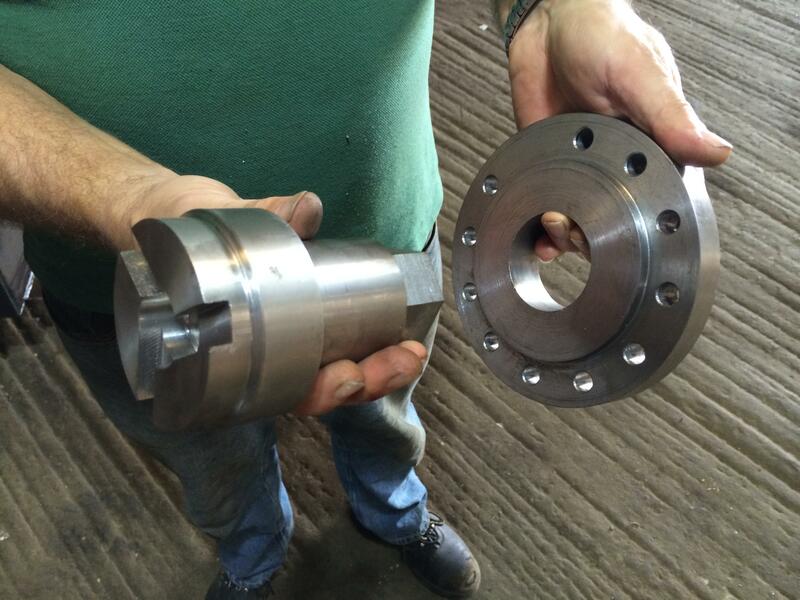 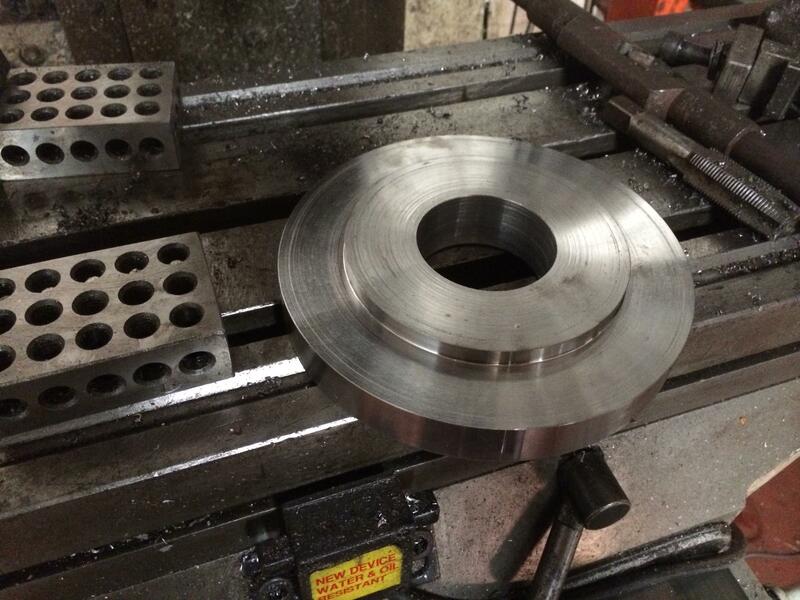 First we packed the blades of from the hub using key steel to ensure all the the blades are set the same. 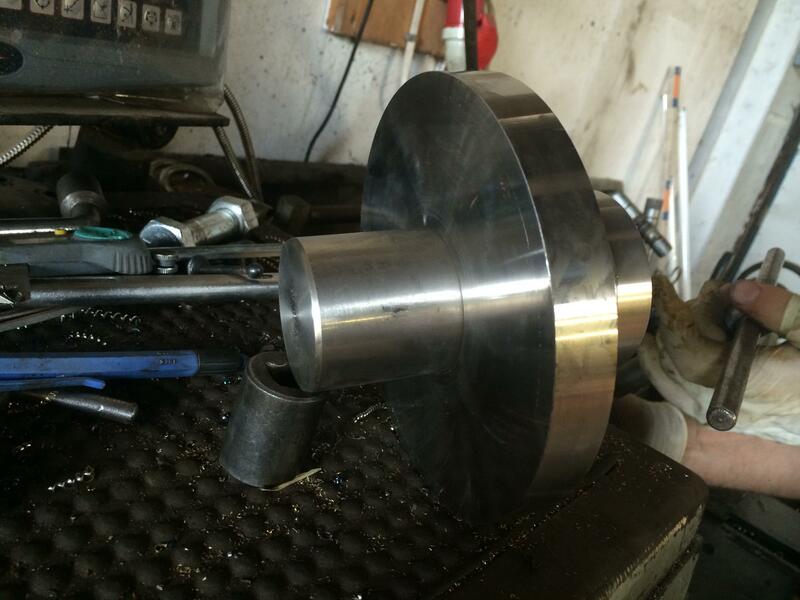 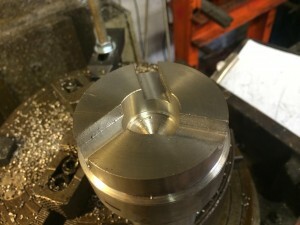 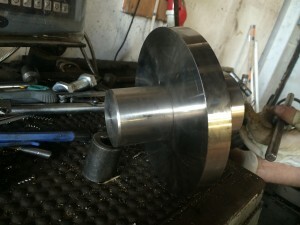 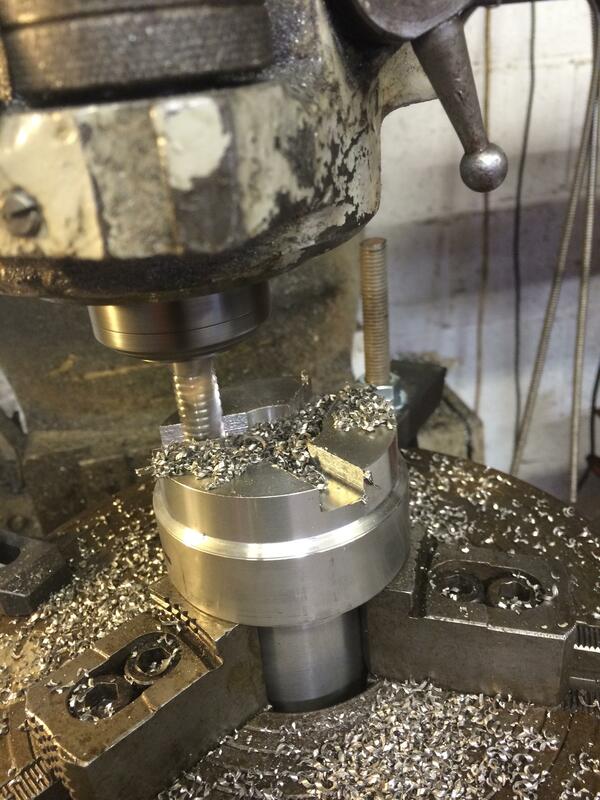 Next we made a die grinder tool holder on the bottom of the engine stand. Slowly we ground down each blade , then move up the die grinder after one full revolution of the engine. 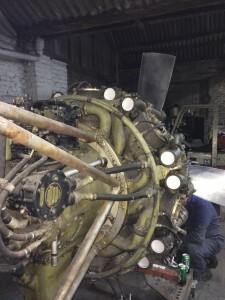 Pete very pleased after half a days work and ten tins of WD40 and two die grinders we had the job done, blades ground down to within a couple of thou. 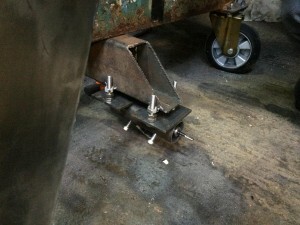 We just need to balance them now then they can be painted. We had a tip-off from Karl Rodgers from 57 Rescue Canada, that there was a couple of 264’s over in Lancashire that had a prop hubs on them and four blades between them. 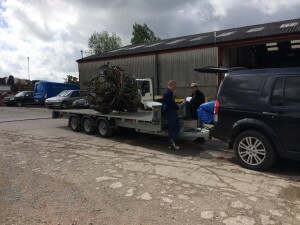 So we popped over and acquired them as they wear a good source of parts for us and also we could make up a complete club prop from the pair. First engine loaded on the trailer, they had to use the biggest toy in the yard! The reduction gear had already been taken off the other engine so on this trip we only brought back the one engine and the reduction gear and prop. We were aware of a 216 Hercules at the Yorkshire Air Museum and had seen it on many occasions. 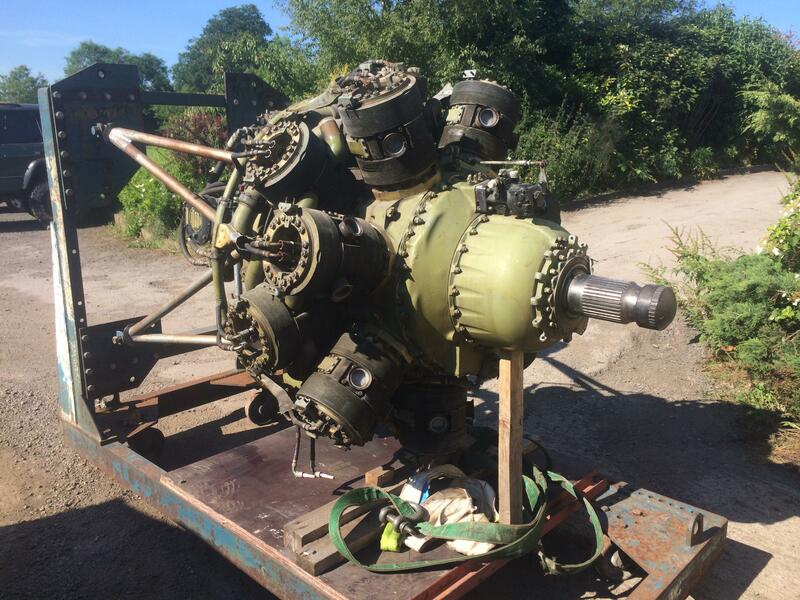 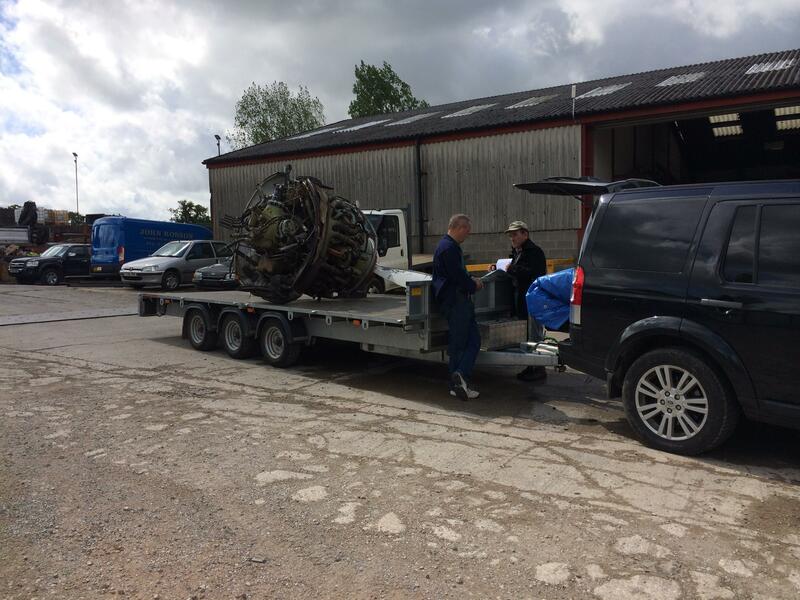 Via emails earlier this year we were told that they planed to get it up and running, which we offered our assistance in any way we could help, it would of been a great sight at that museum to see the old Hercules running next to the Halifax. 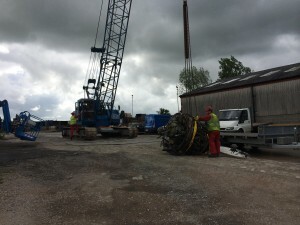 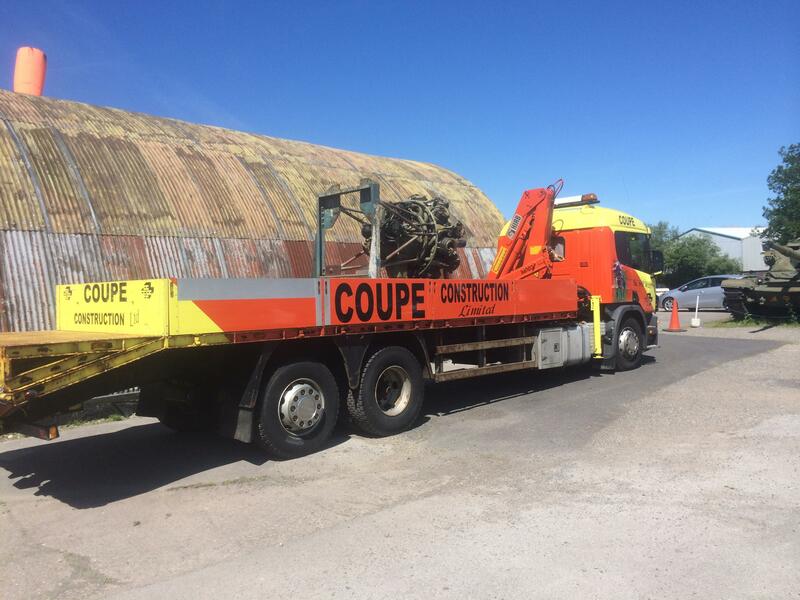 After a few months we had heard nothing so we decided to pop down and see the progress, to our surprise we were told that the engine was being removed from that site by the owner! 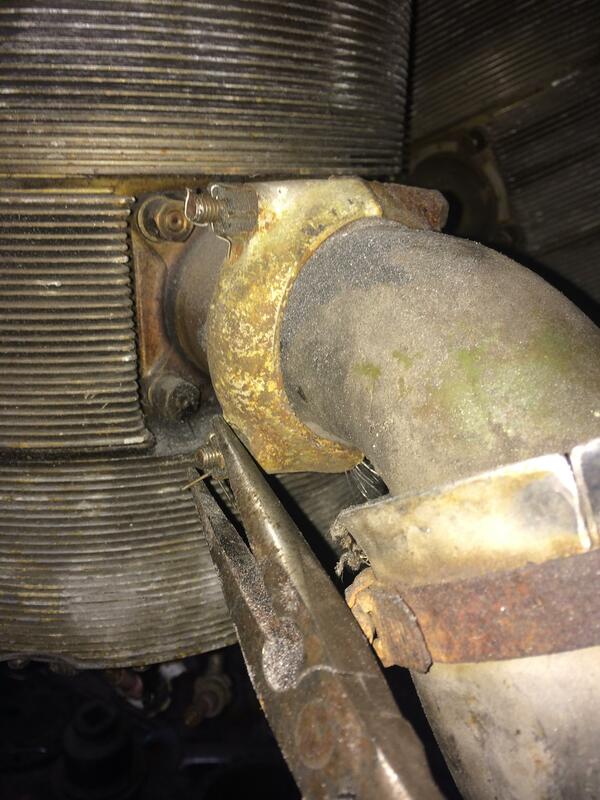 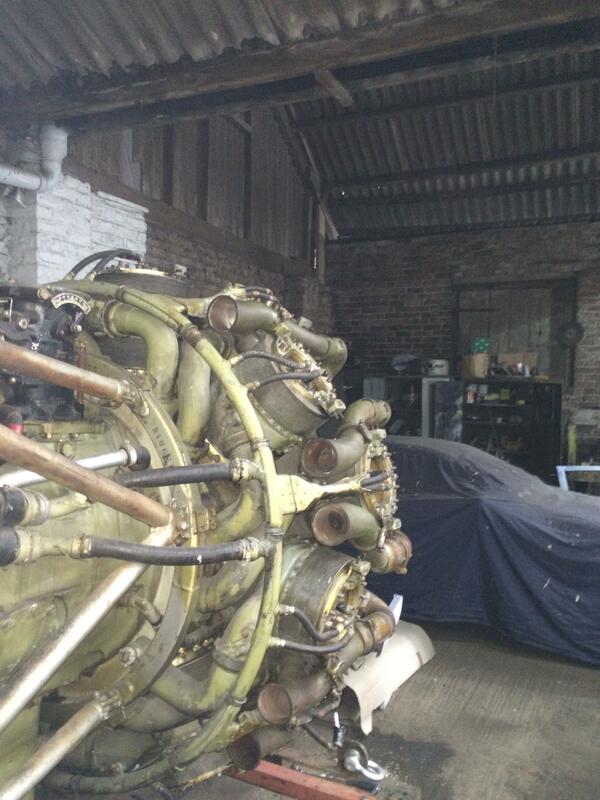 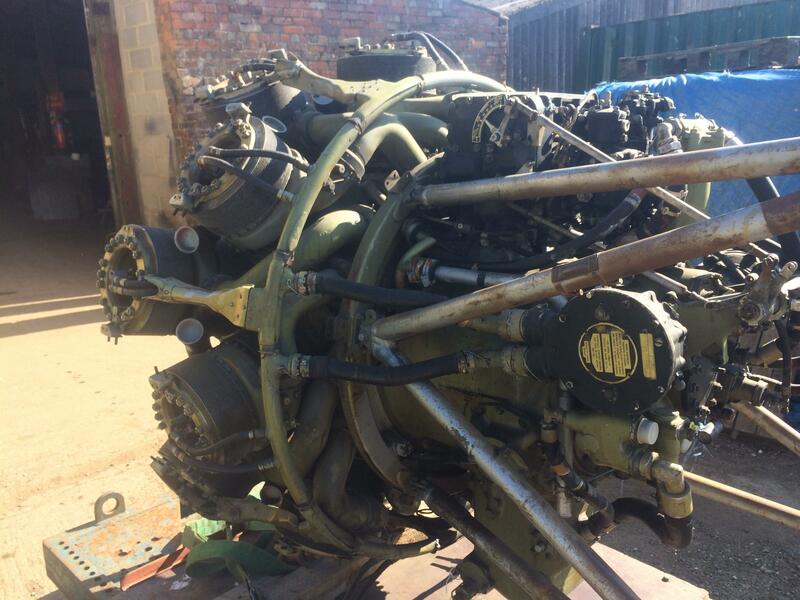 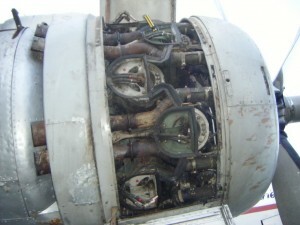 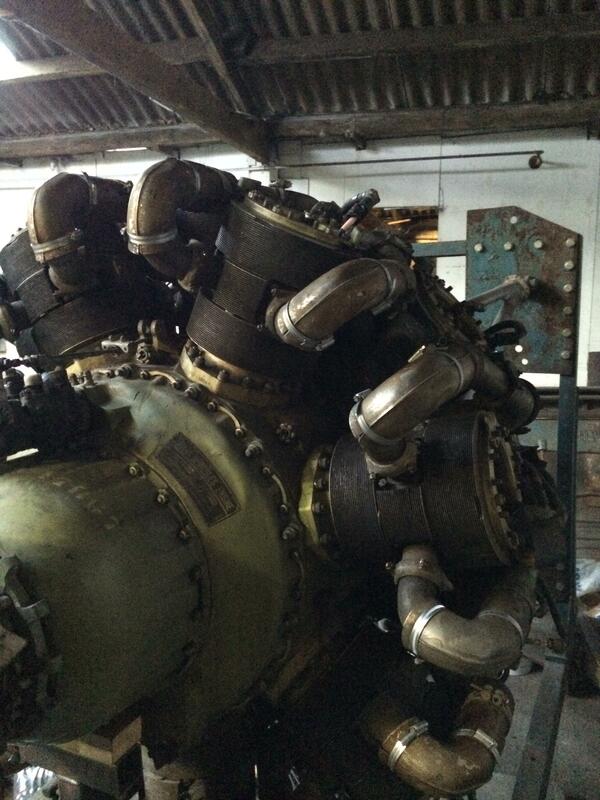 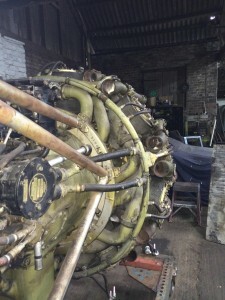 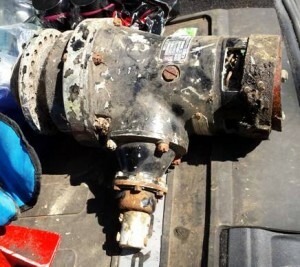 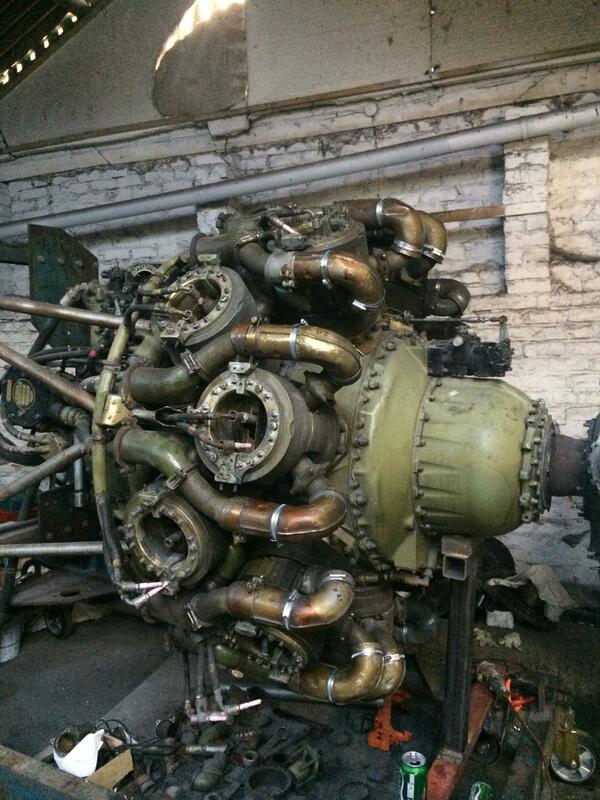 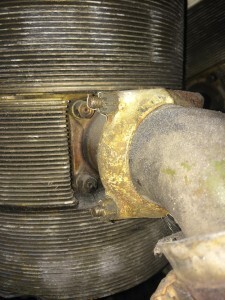 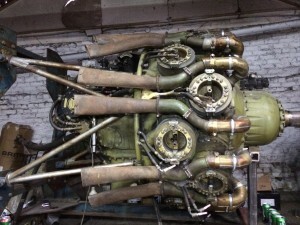 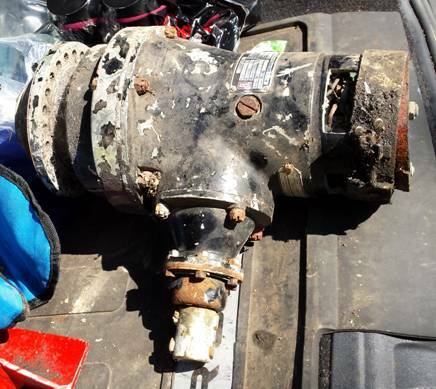 We had a quick look at the condition of the engine as we were told it had been left outside for a year! 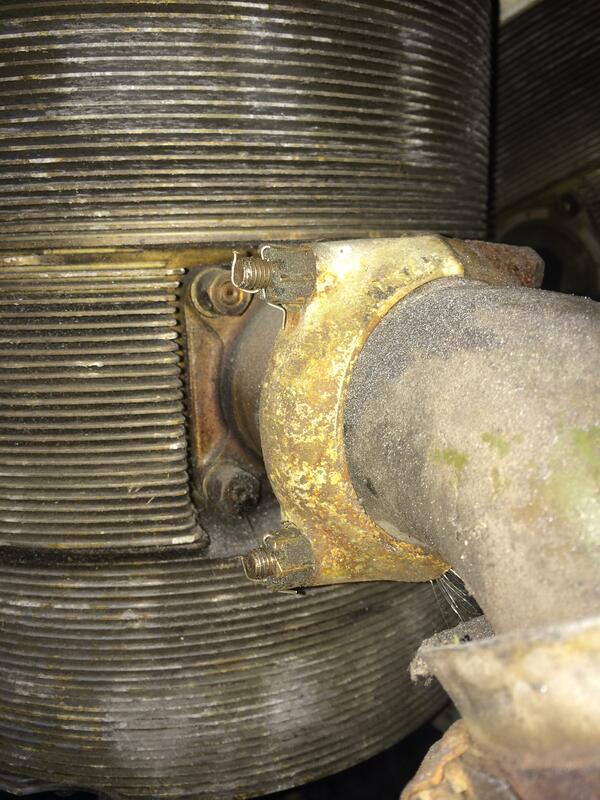 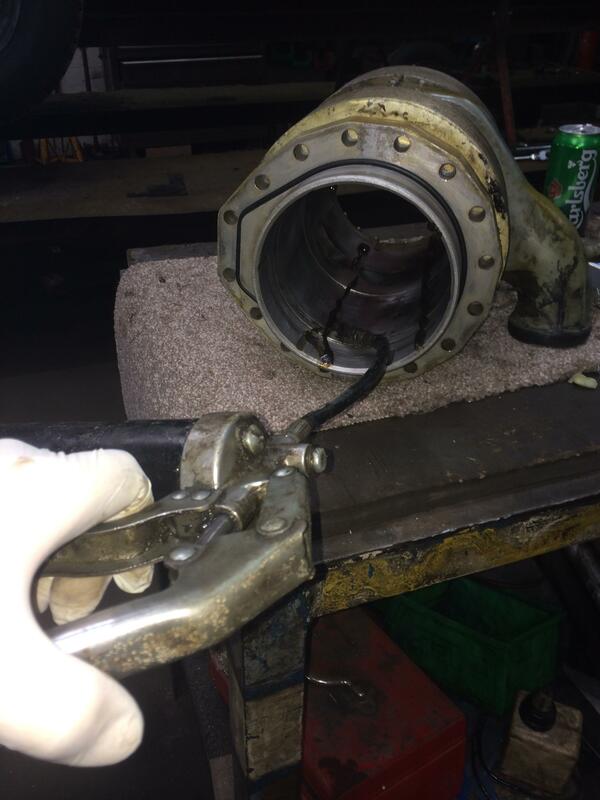 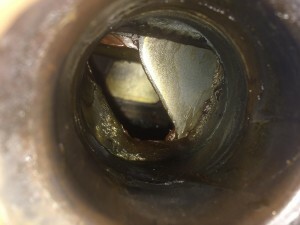 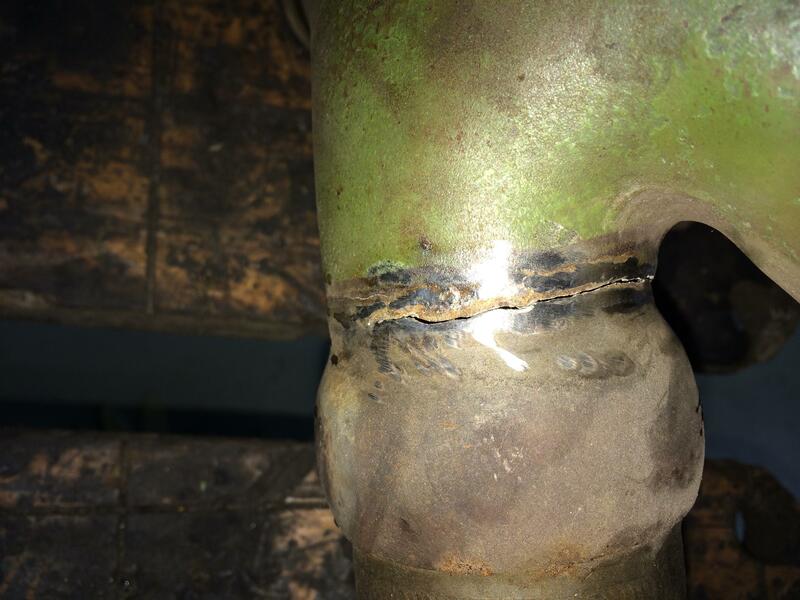 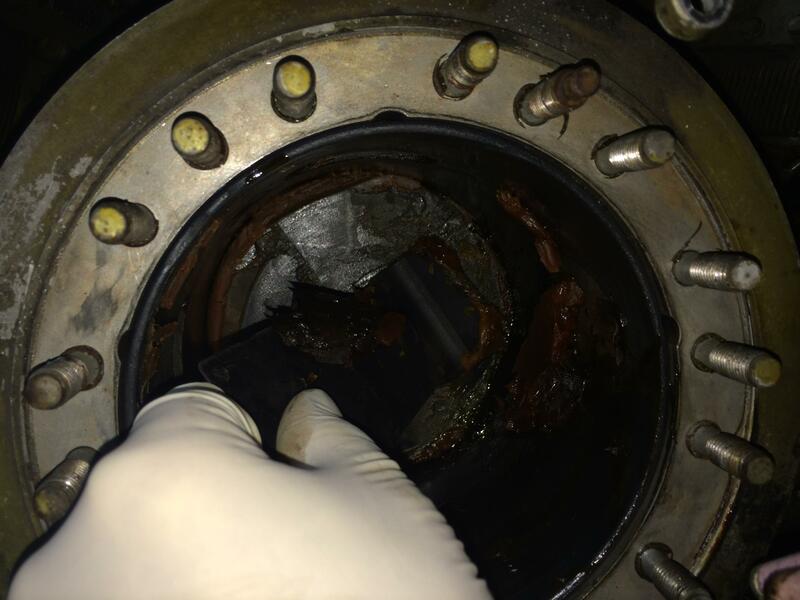 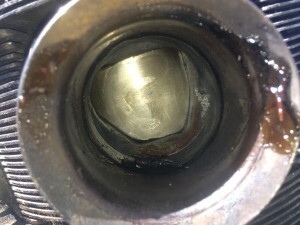 We found that by looking through the exhaust stubs that the sleeves looked in good condition with no signs of corrosion even though we were told by a couple of engineers at the museum that they had looked at it and found that it was seized. 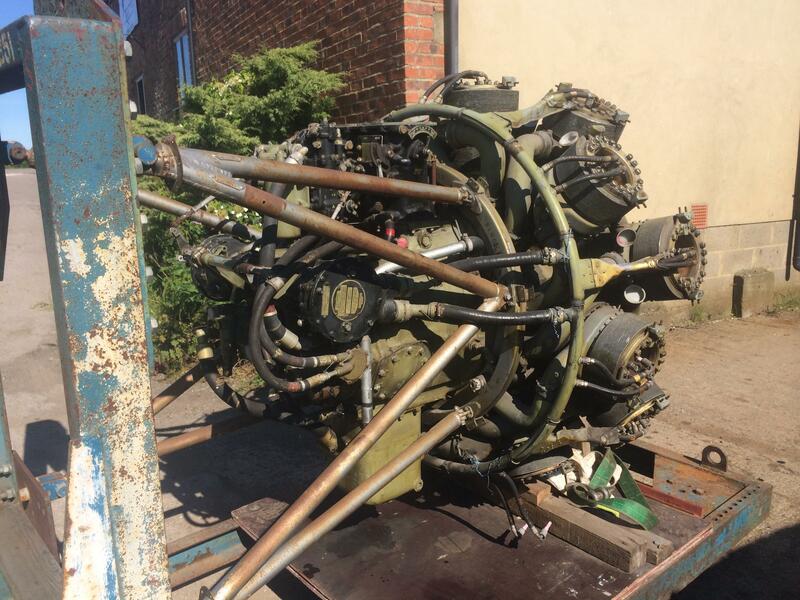 We managed to obtain the owners email address and emailed him straight away to see if we could acquire the engine and get it up and running. 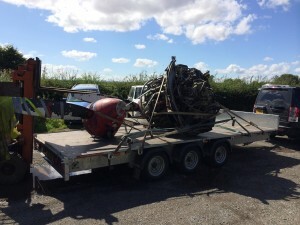 Well, Peter Blackburn who owned the engine and had lent it to YAM on long term loan in running order with with a full set of tools , exhaust and paper work for engine was not to pleased to say the least in how they had looked after his engine. The tools, exhaust and paper work had gone missing and they had left the engine outside! Anyway after a few emails he decided to let us buy the engine and get it up and running again.We have decided to attach a name plate in memory of his father who flew a couple of Hercules in WW2 attached to a Beaufighter in N Africa. 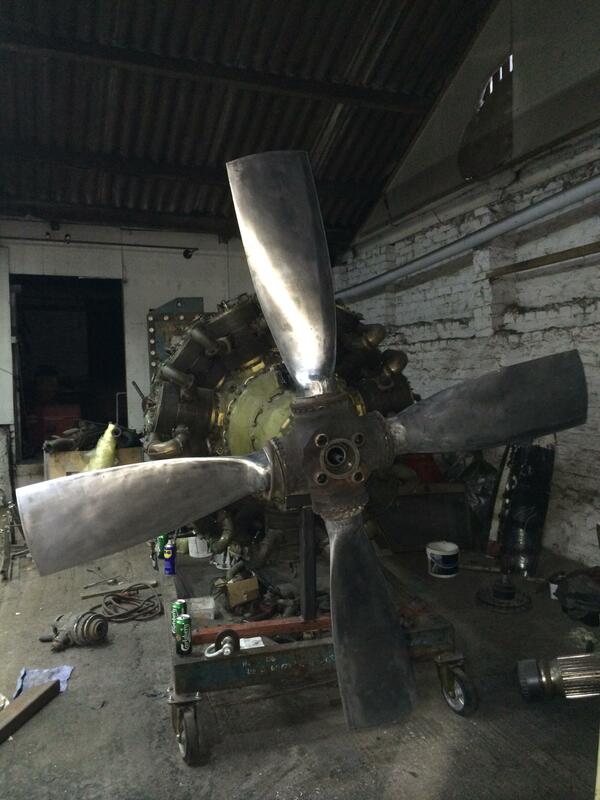 Forty five minutes later it’s back at it’s new home. 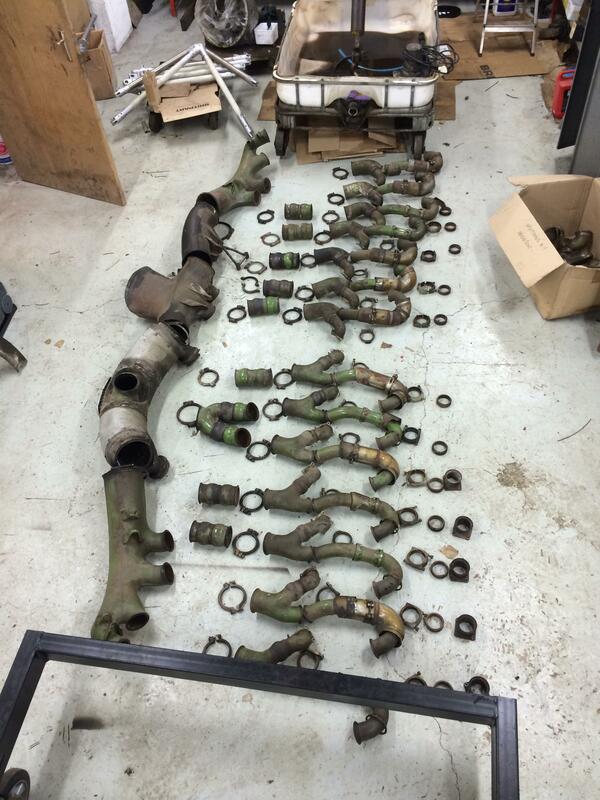 As you see it’s all there minus the exhaust , starter and plugs. 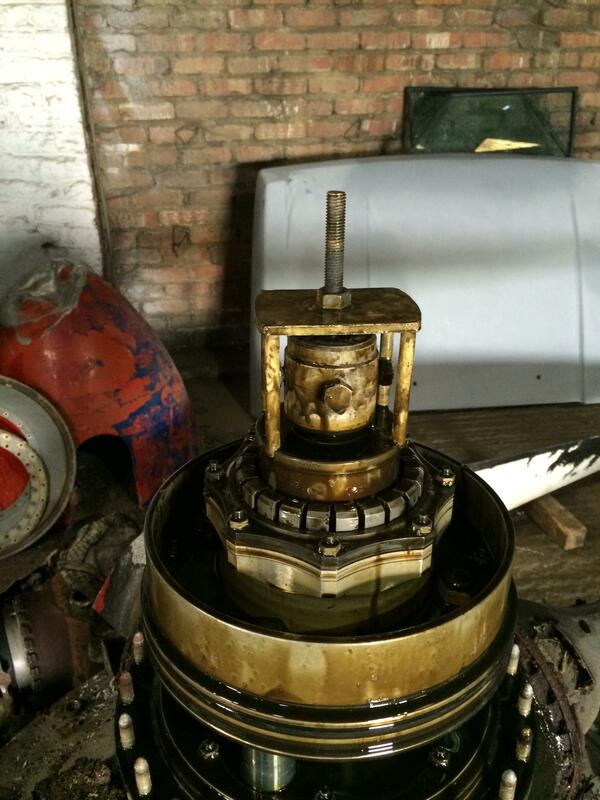 On closer inspection the internals of the engine look in pretty good condition and covered in grease! 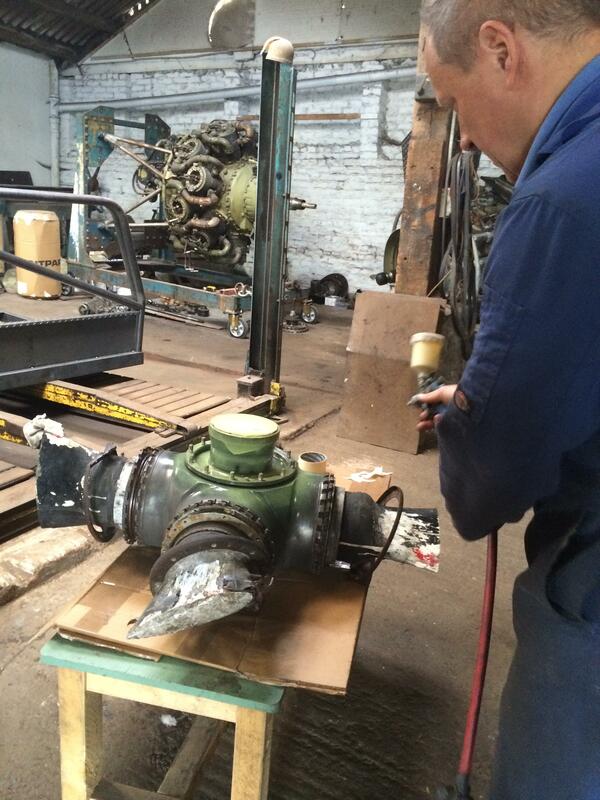 The first job we had to do was make a flange and starter dog so we could try and turn over the engine. 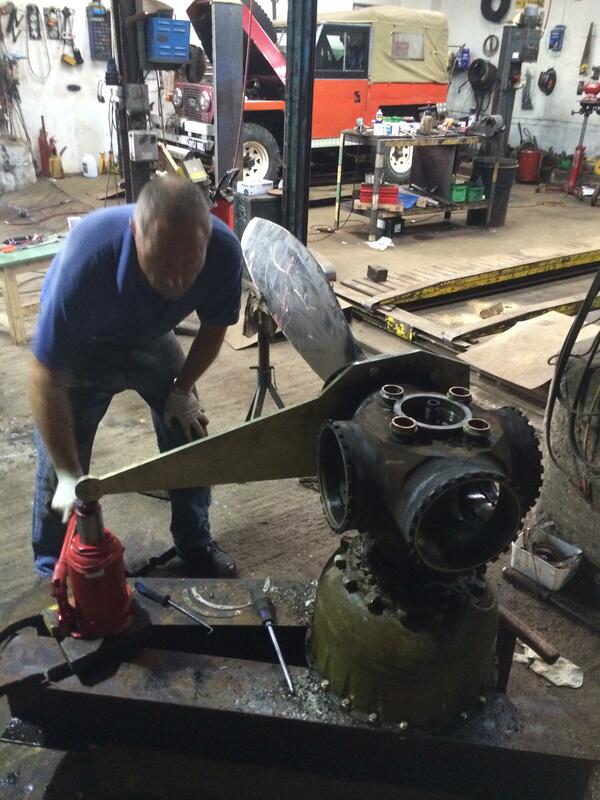 Just a bit more machine work for Pete!, it took a full day but it was needed. 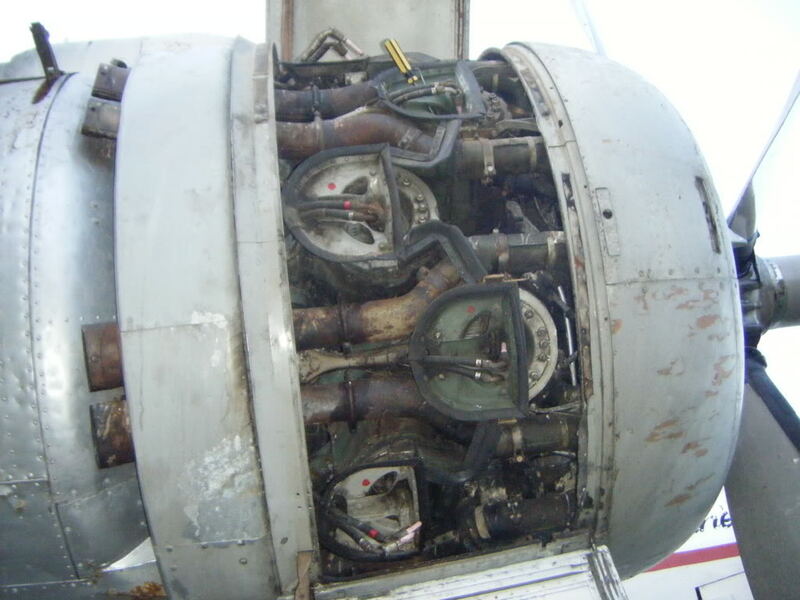 Once installed we tried to move the engine and found that No One sleeve was the only one not trying to move. 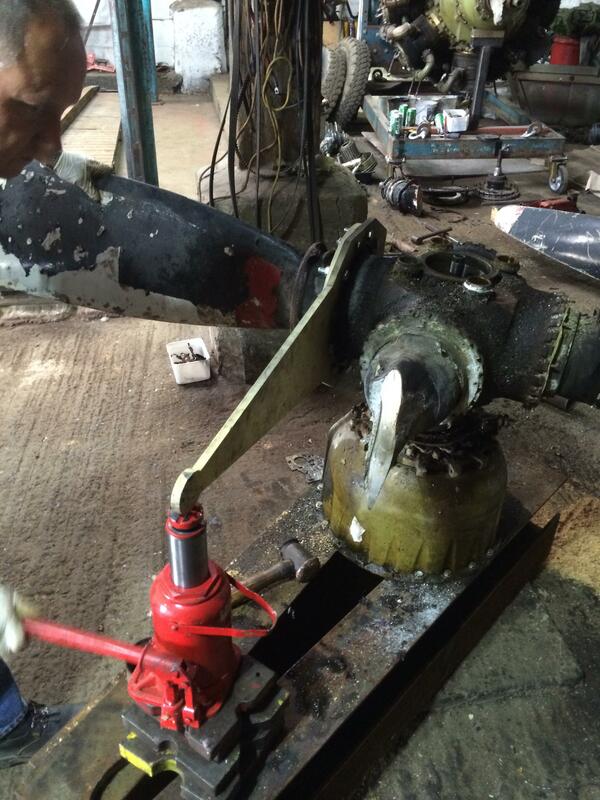 So we removed No.1 head and cylinder and then the engine turned over with ease. 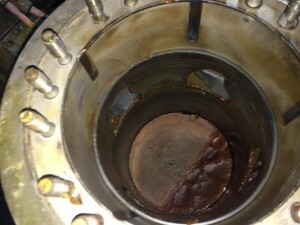 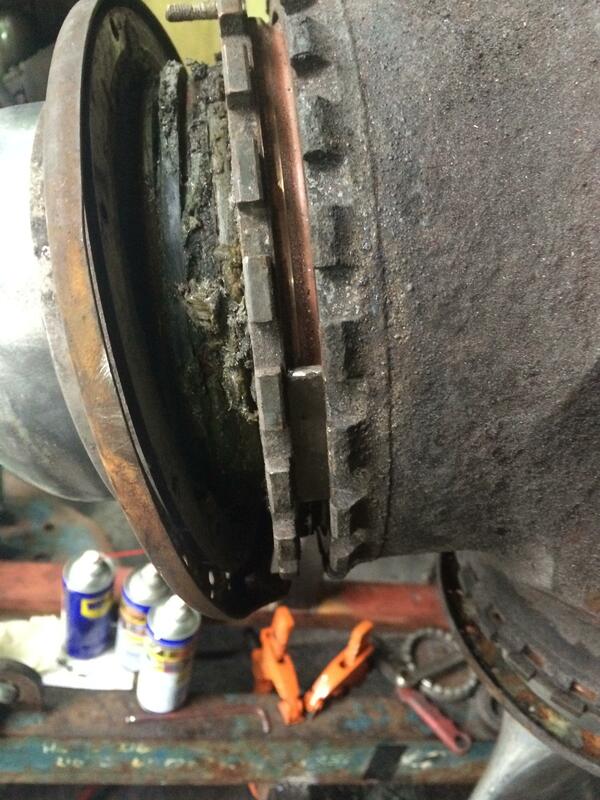 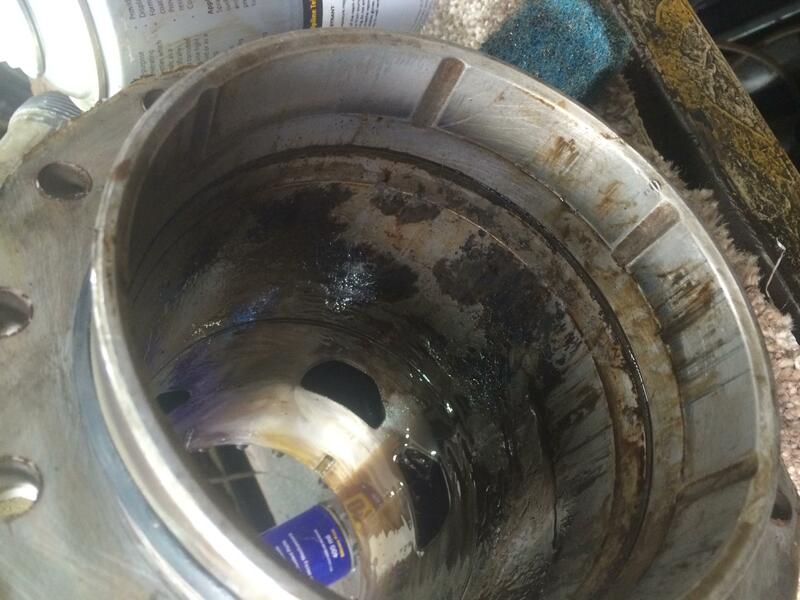 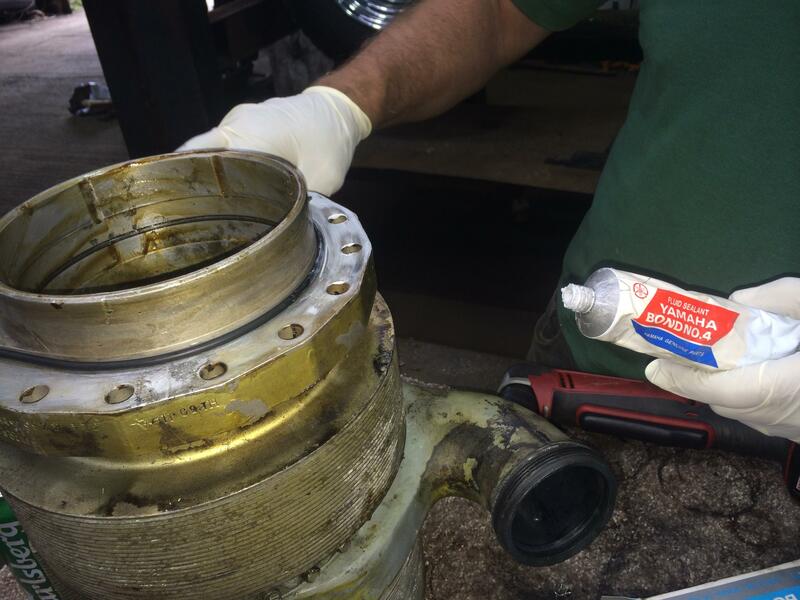 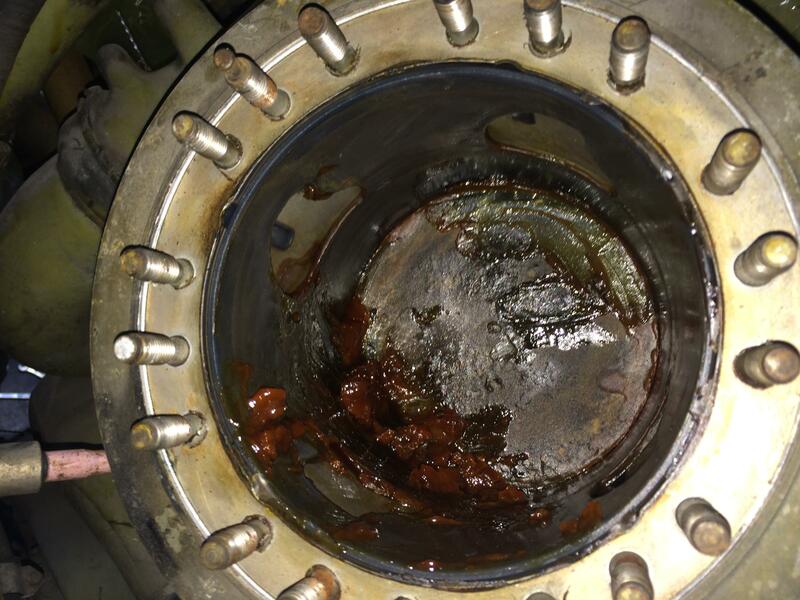 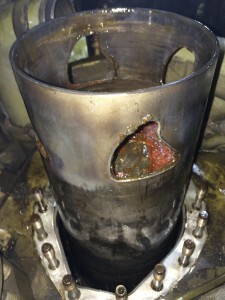 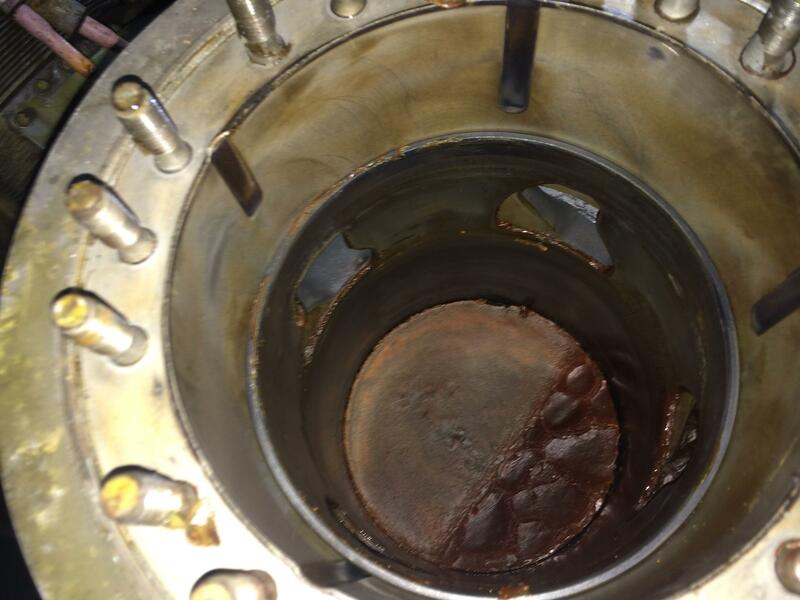 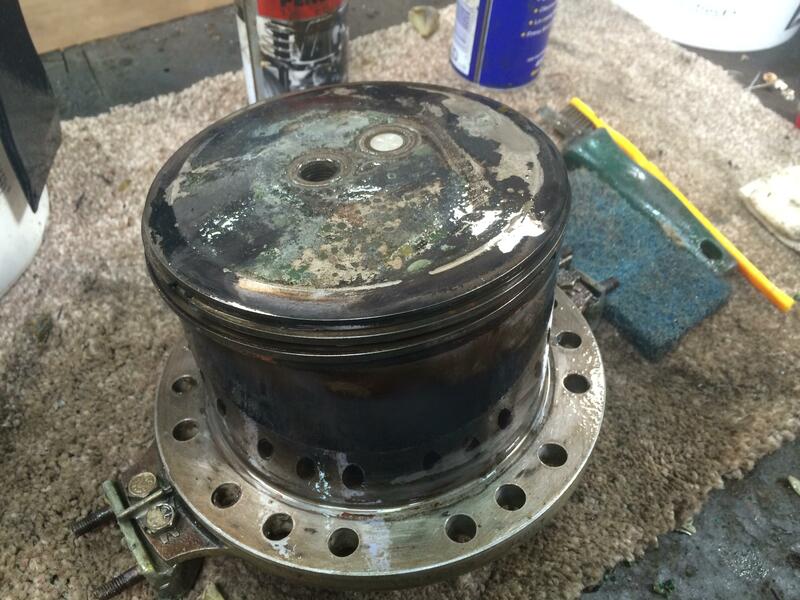 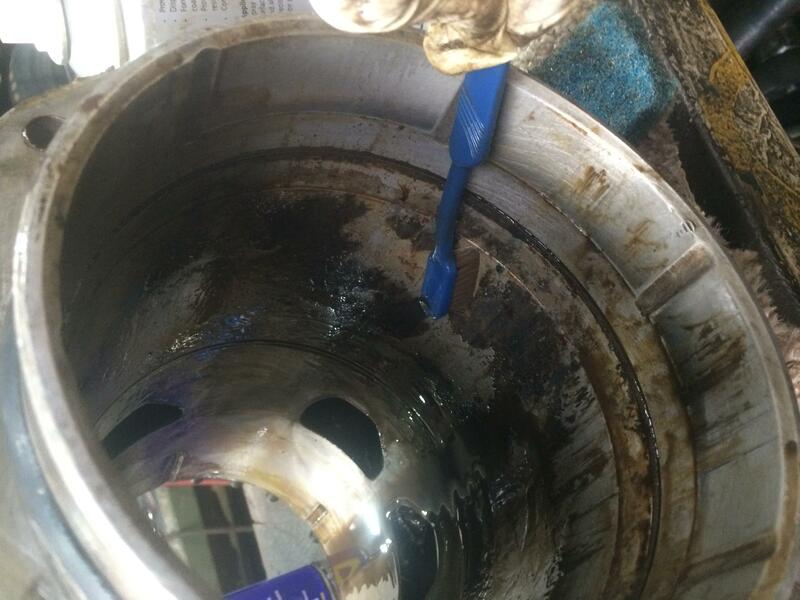 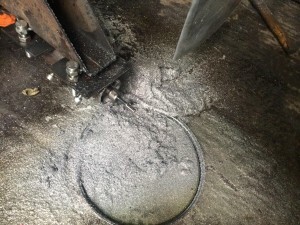 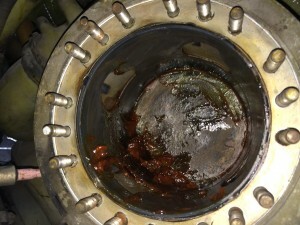 After seeing how much grease was inside the engine we decided to remove all the heads and clean the grease out. 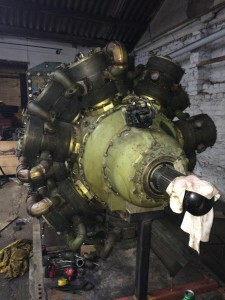 At this point we found out from Peter Blackburn that an engineer that worked for him called Michael Ferguson got the engine running to show Peters father which he loved here running again after so many years since his service in the RAF, then re-inhibited the engine. 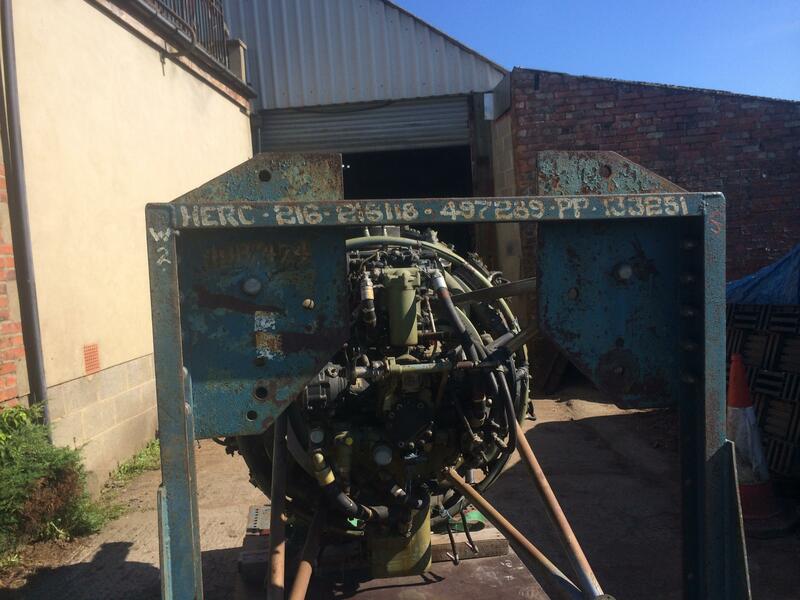 Sadly Michael passed away five years ago so it’s another fitting tribute to him that we get this engine running again, because if it wasn’t for his efforts this engine would of been scrap. The heads took only a Saturday afternoon to de-grease and clean up. 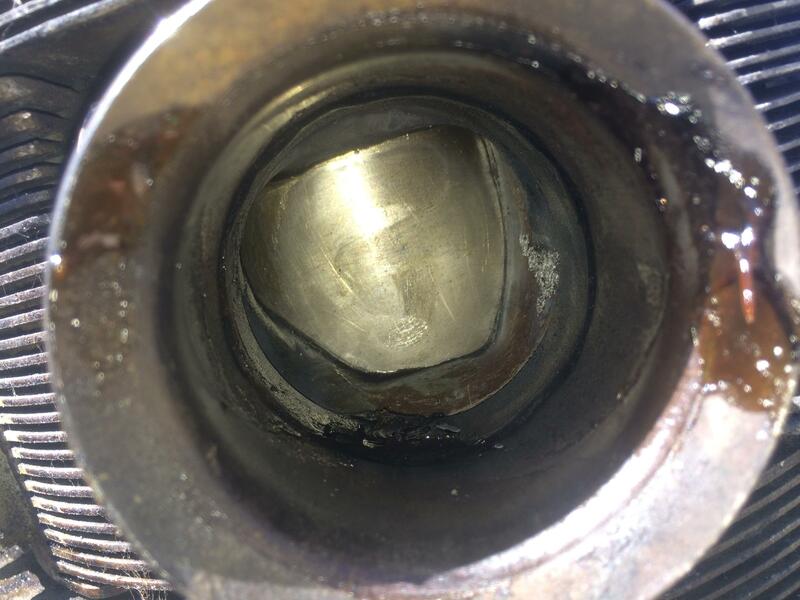 Out with the tooth brush again and clean up cylinder one of dried up deposits and free off the cylinder rings which were in good condition. After cleaning up the cylinder, we lube it up, made a new “O” ring, applied som sealant and refitted the cylinder to the engine.Then we refitted the cylinder heads. Brian Mills a fellow Bristol Hercules restorer helped source new spark plugs and a starter, the starter is in serviceable condition just needs cleaning up. 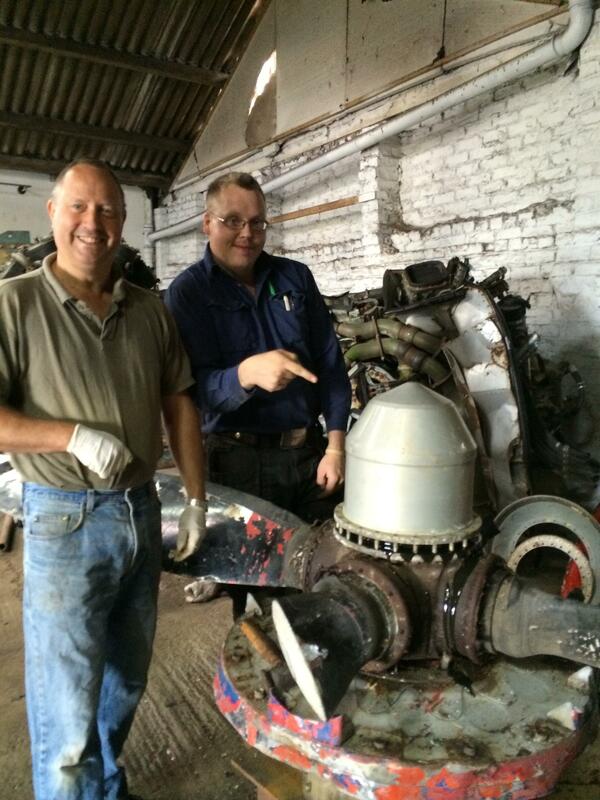 We are very grateful to Brian for all his help in sourcing parts and advice. 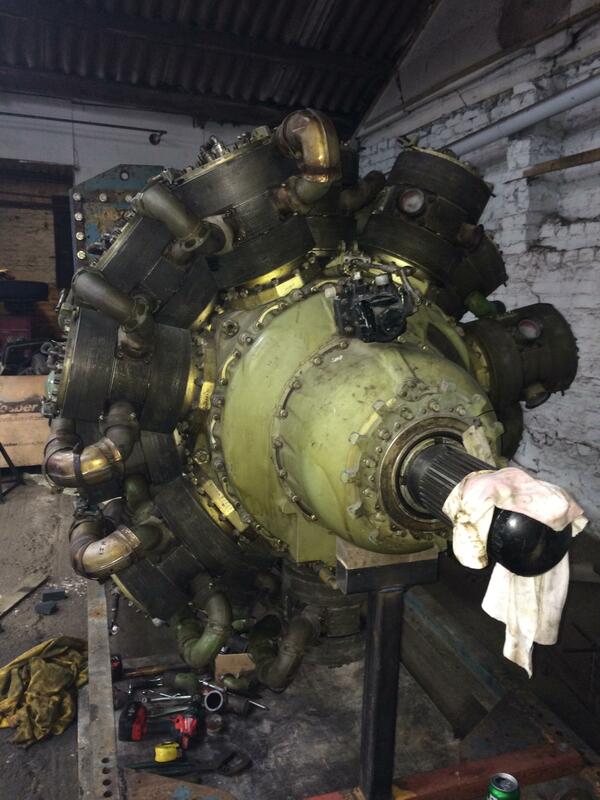 As we planed to give the 216 a test run before the end of September, don’t no why we decided that but it’s always good to have a target date! we better sort out an exhaust system. 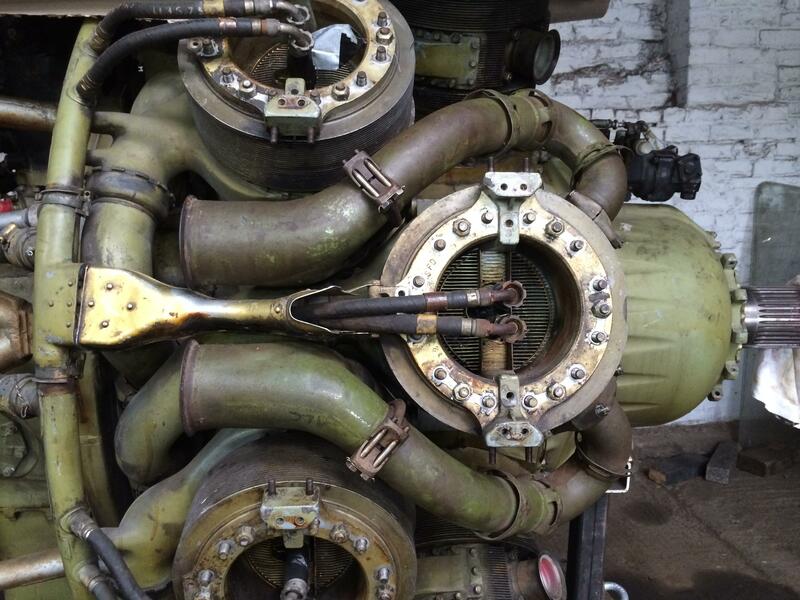 a complete 216 Exhausts are very hard to find now so we decided to fit the front part of the 264 system and then fit exhaust stubs like fitted to the Bristol Freighter. 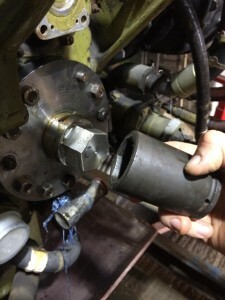 A few of the inter connecting pipes were cracked, so we tig welded them up. On a couple of the swivel joints we heated them up to free them off to allow us to align them up. 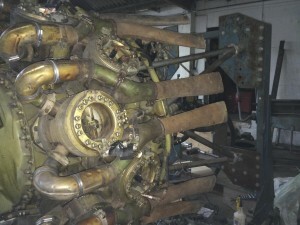 It’s a fiddly job but once you get into the order you have to fit them, it doesn’t to to long to fit the exhaust. 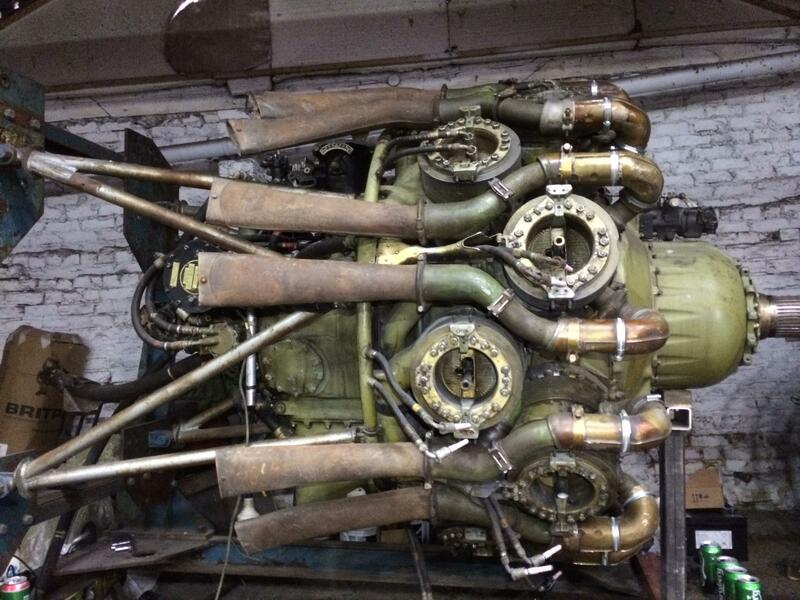 After another Saturday afternoons work, just over half of the exhaust is fitted.